Schirra, who commanded the first rendezvous of two spacecraft in orbit, died of natural causes, David Mould, NASA press secretary in Washington, said Thursday. Mould said he had been suffering from cancer but didn't know if that contributed to the death. "With the passing of Wally Schirra, we at NASA note with sorrow the loss of yet another of the pioneers of human spaceflight," NASA Administrator Michael Griffin said. In 1962, Schirra became the third American to orbit the Earth, circling the globe six times in a flight that lasted more than nine hours. As CBS News correspondent Peter King recalls, Schirra coined a famous line when asked about his thoughts as the clock ticked down to zero before his Mercury flight: "He said, 'Just think of these millions of parts put together by the lowest bidder!' Everybody's used that line since; John Glenn used it, I think they use it on the shuttle today — but it's still a good line!" He returned to space three years later as commander of Gemini 6-A and guided his two-man capsule toward Gemini 7, already in orbit. On Dec. 15, 1965, the two ships came within a few feet of each other as they shot through space, some 185 miles above the Earth. It was the first rendezvous of two spacecraft in orbit. His third and final space flight in 1968 inaugurated the Apollo program that sought to land a man on the moon. In all, Schirra logged nearly 300 hours in space. King notes that Schirra flew in three of NASA's most important missions in history, from his nine-hour Mercury flight (called a perfect engineering test), to Gemini 6, testing multi-craft manuevers essential for getting to the Moon and back. For the Apollo 7 mission in October 1968 — which followed the deadly Apollo launch pad fire which killed fellow Mercury teammate Gus Grissom, Ed White and Roger Chaffee — Schirra's crew ran a shakedown cruise like no other, and for eleven days, they tested what was essentially a brand new spacecraft in every possible way. It paved the way for circumnavigating the Moon that Christmas, Said King, and for subsequent test flights and the Apollo 11 Moon landing. The former Navy test pilot said he initially had little interest when he heard of NASA's Mercury program. 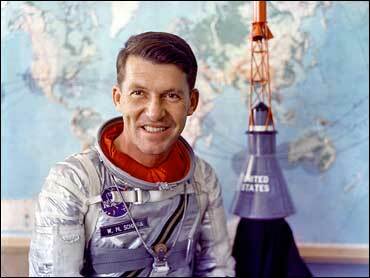 But he grew more intrigued over time and the space agency named him one of the Mercury Seven in April 1959. Supremely confident, he sailed through rigorous astronaut training with what one reporter called "the ease of preparing for a family picnic." Schirra became the fifth American in space when he blasted off from Cape Canaveral on Oct. 3, 1962, aboard the Sigma 7 Mercury spacecraft. The first two American astronauts made suborbital space flights. "I'm having a ball up here drifting," Schirra said from space. At the end of his sixth orbit, Schirra piloted the capsule for a perfect splashdown in the Pacific Ocean. "No one has flown better than you," NASA Administrator James E. Webb told him a few days later. Mercury Seven astronauts who survive him are John Glenn, the first American to orbit the Earth, and Carpenter. "He was a practical joker, but he was a fine fellow and a fine aviator," Carpenter recalled Thursday. "He will be sorely missed in our group." Carpenter said he last saw Schirra several months ago and talked to him just a few days ago. Of America's first forays into space, Schirra once wrote, "We shared a common dream to test the limits of man's imagination and daring. Those early pioneering flights of Mercury, the performances of Gemini and the trips to the moon established us once and for all as what I like to call a spacefaring nation. Like England, Spain and Portugal crossing the seas in search of their nations' greatness, so we reached for the skies and ennobled our nation." Although he never walked on the moon, Schirra laid some of the groundwork that made future missions possible. He liked to stress that NASA never planned to simply send a person to the moon. "Moon and back," Schirra would point out. "We did confirm a round trip from the very beginning. And 'moonandback' is one word. No hyphens. No commas." His Gemini mission represented a major step forward in the nation's space race with the Soviet Union, proving that two ships could dock in space. Schirra's Apollo 7 mission in 1968 restored the nation's confidence in the space program, which had been shaken a year earlier when three astronauts were killed in a fire on the launch pad. His last space flight, aboard Apollo 7, shot into space on Dec. 15 atop a Saturn rocket, a version of which would later carry men to the moon. But Schirra and his two fellow crewmembers were grumpy for most of the 11-day trip. All three developed bad colds that proved to be a major nuisance in weightlessness. The following year, Schirra resigned from NASA and retired from the Navy with the rank of captain. He had logged 295 hours 154 minutes in space. Roger Launius, a space historian at the Smithsonian Institution in Washington, said Schirra "had a personality that was fun and effervescent. He had the gift of gab. He was able to take complex engineering and scientific ideas and translate that to something that was understandable." Launius recalled that Schirra smuggled a corned beef sandwich on his Gemini flight and also reported seeing a UFO ... Santa Claus. Wally, as he liked to be called, was born in Hackensack, N.J., to an aviation family (his father, a Navy captain and pilot during World War I, later barnstormed at county fairs; his mother was a wing walker) who was flying planes in his mid-teens. After graduating from the U.S. Naval Academy in June 1945, he served in the Seventh Fleet and later flew 90 combat missions in the Korean War. He was credited with shooting down one Soviet MiG-15 and possibly a second. He received the Distinguished Flying Cross and two Air Medals. In the 1950s, he served as a test pilot at China Lake, Calif., where he participated in tests of the Sidewinder missile and other defense systems. He complemented CBS anchorman Walter Cronkite during broadcasts of the Appolo lunar flights and the two became a powerful space-coverage team. His commentary on CBS' Apollo 11 moon landing provided half of what he dubbed "Walter-To-Walter coverage." Schirra continued to work with CBS until 1975. In 1984, he moved to the San Diego suburb of Rancho Santa Fe, serving on corporate boards and as an independent consultant. He also was a director of the San Diego Aerospace Museum, a trustee of the Scripps Aquarium, and a member of the International Council of the Salk Institute. He also co-authored several books, including "We Seven" (1960), "Schirra's Space" (1988), and "Apollo: The Epic Journey to the Moon" (2002). Schirra was inducted into the Naval Aviation Hall of Honor in 2000. His favorite craft became the Windchime, a 36-foot sailboat. Survivors include his wife Josephine, his daughter Suzanne, and son Walter Schirra III.